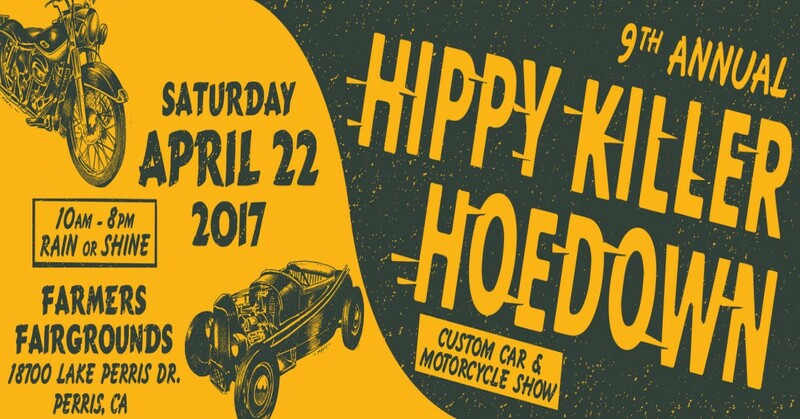 The Hippy Killer Hoedown was created for automobile enthusiasts and their families. Expect live music, giveaways, custom cars, vans, motorcycles and vintage and hooligan motorcycle flat track racing. Located at the Farmers Fairgrounds in Parris, CA the main gates open at 10 am to 8 pm. Gates open to the public from 10 am to 8 pm. Get your tickets today and save, otherwise the gate entry is $15 the day of the event.